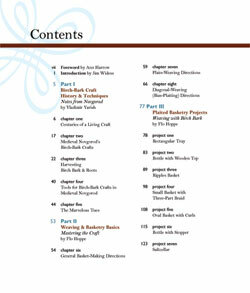 "Plaited Basketry with Birch Bark"
The table of contents reveal the full scope of this extraordinary book. 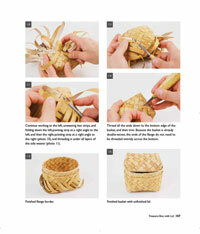 Voluminous history, 18 exciting, graduated projects that will make you an expert weaver of plaited baskets. And, you’re not limited to just birch bark. 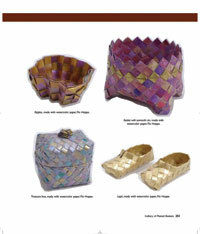 There are many flat materials with which you can weave these marvelous projects and some of these materials are demonstrated in the gallery section. 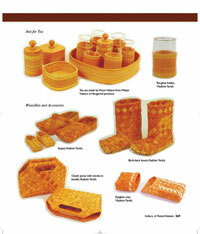 The history of the uses of birch bark is an exciting one. It was a critical material for containers, medicine and shelter for our early ancestors in the polar north and higher altitudes. 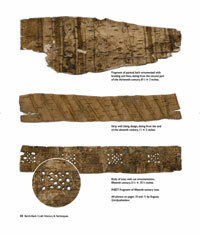 Vladimir’s research with archaeological digs and museum visits documents the use of birch bark in Novgorod, Russia for containers, shoes and literary works. 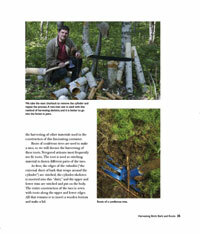 You’ll take an fascinating journey into the Russian forest with Vladimir as he harvests strips and sheets of birch bark as well as birch and spruce roots using careful, sustainable methods which have preserved these forests for centuries. 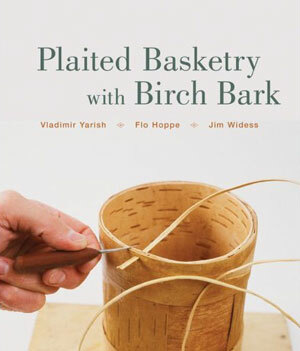 Vladimir will teach you how to prepare the bark and transform the birch bark strips into carefully measured elements for weaving. 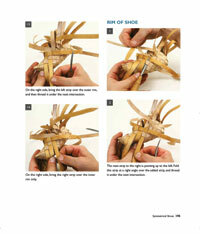 Through hundreds of clear, detailed step-by-step photographs for 18 basketry projects, you’ll learn how to weave objects ranging from the very simple to a pair of birch bark shoes. 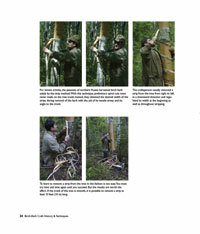 Starting with a birch log, you see how Vladimir is able to remove the central wood core, leaving a complete birch bark circle which becomes a water-tight birch bark thermos for carrying hot soup or cold milk incorporating a non-spilling, hand carved wooden lid. 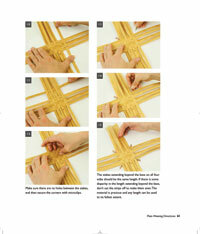 You’ll also have whole chapter with just plaited embellishments for ornamenting the sides or lids of your plaited creations. 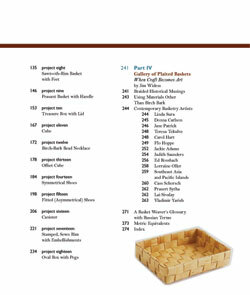 The gallery section includes work of artists: Linda Sura, Donna Carlson, Jane Patrick, Teresa Tekulve, Carol Hart, Flo Hoppe, Jackie Abrams, Judith Saunders, Ed Rossbach, Lorraine Oller, Cass Schorsch, Prasert Sytha, and Lai Sivalay, using contemporary materials which are readily available in any community if you are not fortunate enough to have access to birch bark. 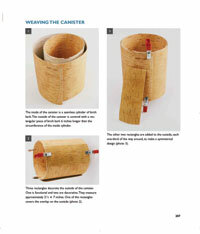 All of the methods and projects taught in this book, with the possible exception of the birch bark thermos, can be woven from these readily available materials. And finally, a gallery of the extraordinary talent of our chief author, Vladimir Yarish. The variety and technical ability of this artist will continue to astound you as you repeatedly refer back to this text for inspiration. These teeny copper mini clips are indispensable for weaving birch bark, water color paper, copper strips, lauhala, or 35mm film. We have been able to have these special clips manufactured for us and are offering two packages of 10 clips with each book you purchase. These clips are tiny, will easily hold 1/8”, 3/16”, 1/4” strips firmly while being able to get into tight weaves where clothespins and other small clamps cannot reach. "This book is a breath-taking work. Initially I was visually impressed by the layout and the number of photographs included for such a low price and then,as I explored further, by the scope and depth of the subject. 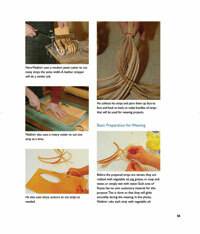 There is even a detailed chapter on actually harvesting birch bark which was fascinating. 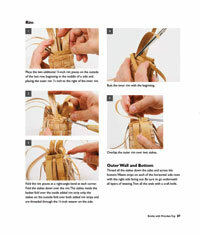 However paper can be substituted for those of us without a Russian forest in our back yard! 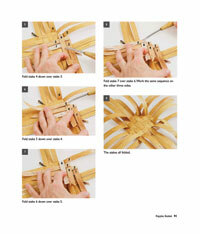 I'm a paper artist not a basket maker so I appreciate the detailed and well written instructions by Flo Hoppe and the numerous illustations accompanying the many projects. 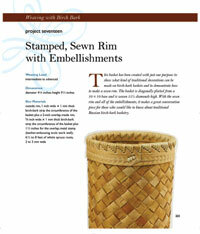 As a complete novice, I have so far mastered the woven cubes which make wonderful beads. I doubt I will ever achieve the mastery needed for some of the projects but appreciate their artistry, complexy and the history behind them. 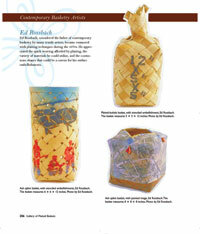 As if the exquisite work of Vladimir Yarish was not enough, this book also includes an extensive artists' gallery with innovative work by many well known basket makers. Order now and receive 20 free copper mini-clips. A $5.98 value!